Months after launching the Huawei Mate 8 in China, Huawei has now launched the handset globally at the on-going CES 2016. 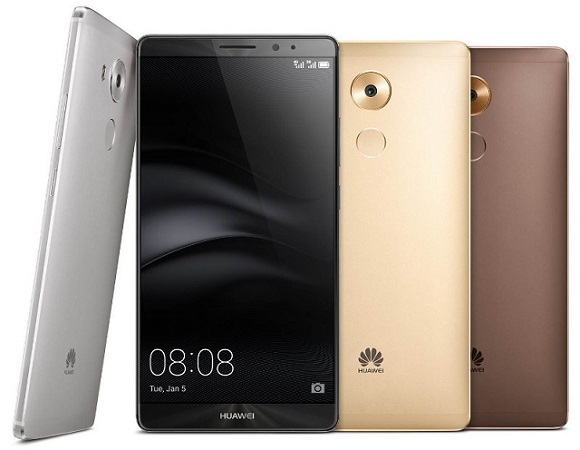 Huawei has announced the launch of the Huawei Mate 8, which is the company’s latest flagship smartphone powered by the powerful Kirin 950 processor and running the latest Android Marshmallow version. The device has a 6 inch IPS 2.5D glass display with resolution of 1920 x 1080 pixels. The smartphone is powered by the company’s home-grown octa core Kirin 950 processor and is available in two variants – one with 3 GB of RAM and 32 GB of storage, the other with 4 GB of RAM and 64 GB of storage. The Huawei Mate 8 has a 16 MP rear facing auto focus camera with Sony IMX298 sensor, PDAF, OIS, f/2.0 aperture and dual-tone LED flash. There is also a front facing 8 MP camera. The device runs on the Android Marshmallow version with a massive 4000 mAh battery. The handset is available in Champagne Gold, Moonlight Silver, Space Gray and Mocha Brown colour options.